This is taken from What Can I Eat Now? 30 Days on the GAPS Introduction Diet Handbook. 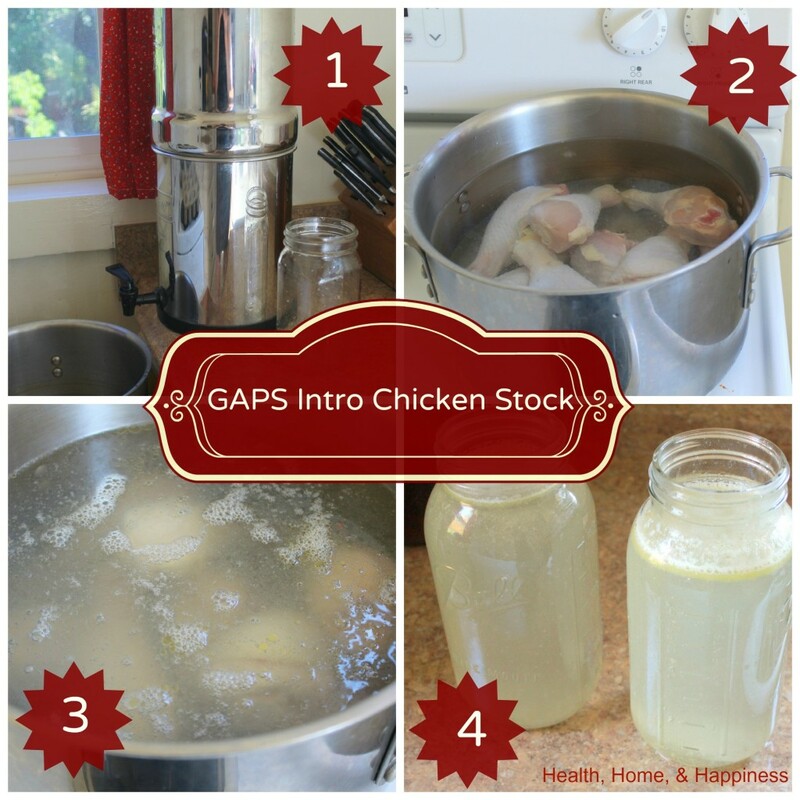 GAPS Intro chicken stock is different than stock later on, as you don’t brown the bones at all so the stock is pale. This is to prevent any harder to digest well cooked pieces of chicken from slipping through into the stock. You can still salt it to taste with sea salt, and broth is recommended to be served with every meal while on Intro. One to two days before starting intro, you’ll want to familiarize yourself with making chicken broth. Making your own broth can seem weird, but this traditional food is essential for healing. Optional: 2 tablespoons fresh thyme, 6 cloves garlic, 1 onion, 1 inch of ginger root, vegetable scraps such as the ends of onions and carrots, core of the cabbage, leaves from celery, etc The rich golden color comes from onion skins and can make broth appear more appetizing, give it a mellow flavor, and add some minerals. Rinse chicken. Reach inside cavity and remove giblet package. Remove giblets from package and add to the stock pot. Place chicken in the stockpot. Fill pot 3/4 full with filtered water and any optional herbs and vegetables. Cook on medium-high until bubbling, then reduce heat to low and allow to simmer, covered, 4-8 hours. When done, allow to cool then pour broth through a strainer and transfer to mason jars to store in the fridge. I do one jar at a time, cleaning out the strainer as needed during the process. Do not discard the soft gelatinous parts around the bones or the skin; reserve that and use an immersion or regular blender to blend it into your broth and soups. Pick any meat off the bones that you can after the chicken broth has been removed, reserve meat to add to soups or serve alongside. Discard the remaining bones in the pot. Later on the GAPS Diet you can do a ‘second run’ of bone broth with the bones after picking the meat off, but for Intro we want the more gentle meat broth that is made with meat on the bones. The terms 'broth' and 'stock' are often used interchangeably, and can be confusing when trying to figure out the correct form to use for gut healing. In the GAPS Introduction Diet, the important part is that we use bones that still have the meat and bones on them, and that we don't simmer for an long amount of time. I call this 'broth' as in 'meat broth' but some people call this 'meat stock'. When we simmer our broth for a shorter amount of time, less histamines are produced. Many GAPS people have trouble with histamines, though this intolerance is usually healed when the gut is balanced again. Since we keep the skin and meat on the bones (rather than eating it off, and then making stock out of the leftover bones) our broth is more rich in protein and fats than it would be otherwise. Pressure cookers are not allowed per the GAPS book. Many of us have experimented with pressure cookers and found no change in how we feel when using them, and so we choose to use them. Instant Pots can make meat broth in the same way that slow cookers do, but in much less time. Broth made in the Instant Pot has benefits as well, it is less likely to bother those with histamine sensitivities due to the shorter cooking time. It also is fast to make, and the Instant Pot is well contained, so it contains the smell of simmering broth well. To make meat broth in the Instant Pot, pressure cook on high pressure for 2 hours using the same directions as for stovetop or slow cooker other than the cooking time. Extra cooked chicken from making broth? Click here to see how to use it. Hi, I am wondering if you can make the broth in the crock pot instead of a stock pot. Cooking it on low for 8-12 hours? Are the benefits the same? Hi Cara, I just bought your GAPS Intro Guide as we are going to start intro in a few weeks. I’m so glad I got your book because it is really helping me organize all that’s needed to prepare. As stock is such a big part of intro I have a few questions: If using chicken parts how many pounds should I strive for if using a 6 quart pot? Also, would I be messing up intro guidelines if I included a carrot, celery and onion while cooking the broth – but straining it out later? How do you store your broth in the freezer, in glass or plastic? I have had several glass jars crack in the freezer – after I left 2 inches of space and let it cool in fridge first. Thanks for all your help! Carrots and onion are fine cooked in broth in Stage 1 and up. Celery not until stage 3. I am also trying to figure out how many pounds of parts I need. Does anyone else have trouble with chicken broth? When I drink it I feel bloated and not great. Wondering if that is a detox of sorts or if my body can’t tolerate it. Any ideas of where I can get more information on that? 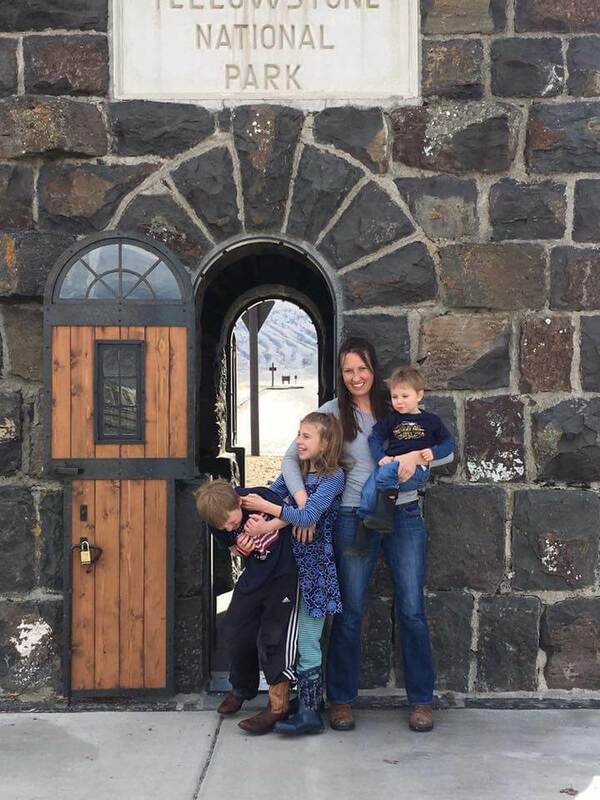 Considering starting the GAPS this summer for my son and I. When I took all the soft pieces off my chicken, and the skin, and poured in the stock and it all throughmy Vitamix, it got all yucky and kinda gray! My stock then looked emulsified! What did I do wrong? Cooking your stock at too high of heat for too long. You really want the meat and bones to simmer instead of a heavy boil for long periods. A cloudy stock isn’t necessarily bad, just not desirable. Cara, in the GAPS Dr. Campbell-McBride instructs to cook the chicken for 1 1/2-2 hours. Can you explain your reasoning for cooking yours much longer? Thanks so much!